Okay, now that we've taken down the Christmas decorations (except the trees), I spent a little time at my craft table. Ahhh...and I enjoyed it! 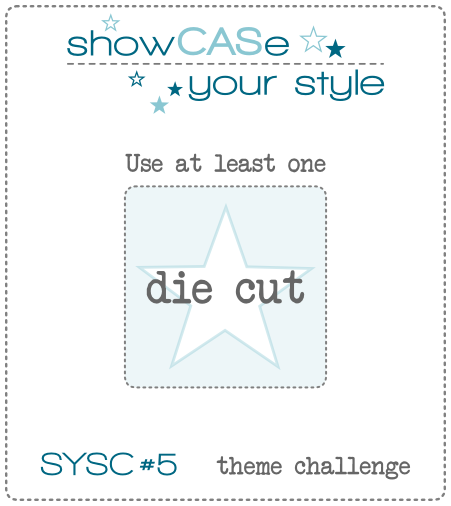 I'm sharing one of 2 cards that I created for the ShowCASe Your Style Challenge #5 - die cut theme. As you can see, we are to use at least one die cut. Well...I used lots of die cuts on my card. I cut the cover plate from white card stock first, then chose 9 colors of card stock to die cut and place inside the negative spaces. It took a lot longer than I thought it would, but it was well worth it. It turned out to be one of those cards that just makes me smile!